to meet local dancers and to offer workshops of their favorite dances. follow with grace and pleasure. ready for the social dance floor. Each workshop covers beautiful variations for the dance floor, as well as simple and fun skills to benefit your dancing. Dancers should have partner dance experience. 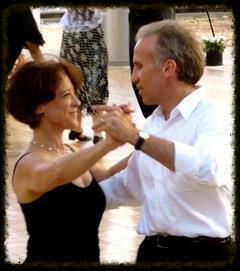 We will start with partner connection and the fundamentals taught at several skill levels by addressing important aspects of your dancing. Which Waltz will you learn? Waltz music comes in a wide range of speed. We focus on Cross Step Waltz, a gorgeous dance of the mid speed range, while adding key moves of Slow Waltz and faster Rotary and Viennese Waltz. Uwe has over 15 years of teaching experience. He and Colleen are in their 7th year of teaching Waltz, Nightclub Two-Step and several other dances together. Many students enjoy their teaching in the Portland area. Uwe has danced Waltz for over 30 years, starting in Germany as a teen. He has learned Nightclub Two-Step directly from Buddy Schwimmer the creator of this beautiful dance. Colleen and Uwe love these dances and can’t wait to teach them in White Salmon.